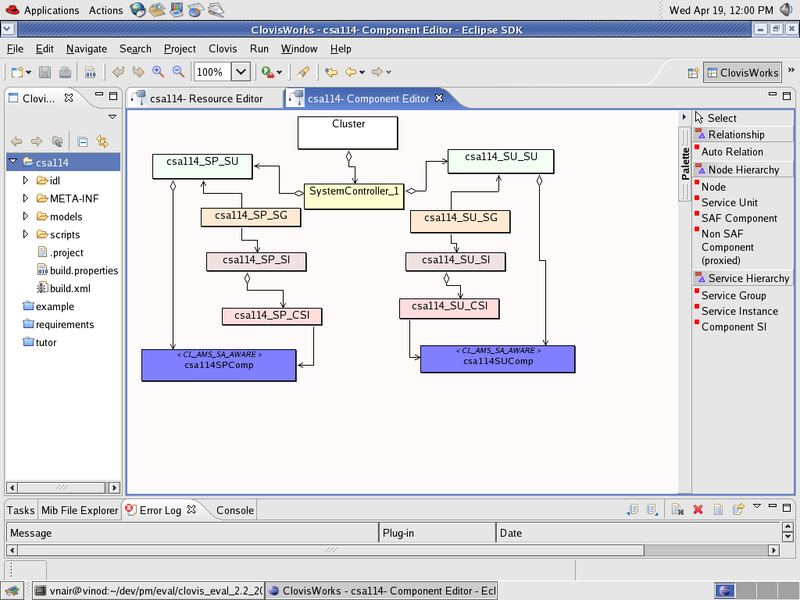 OpenClovis IDE is an Eclipse-based integrated development environment designed to simplify and accelerate the development of services platforms. Coupled with SAFplus this intuitive software solution streamlines the process of specifying the information model, high availability aspects and communication infrastructure of a system. OpenClovis IDE stores all information describing a project in well defined XML files that can be modified by the user. 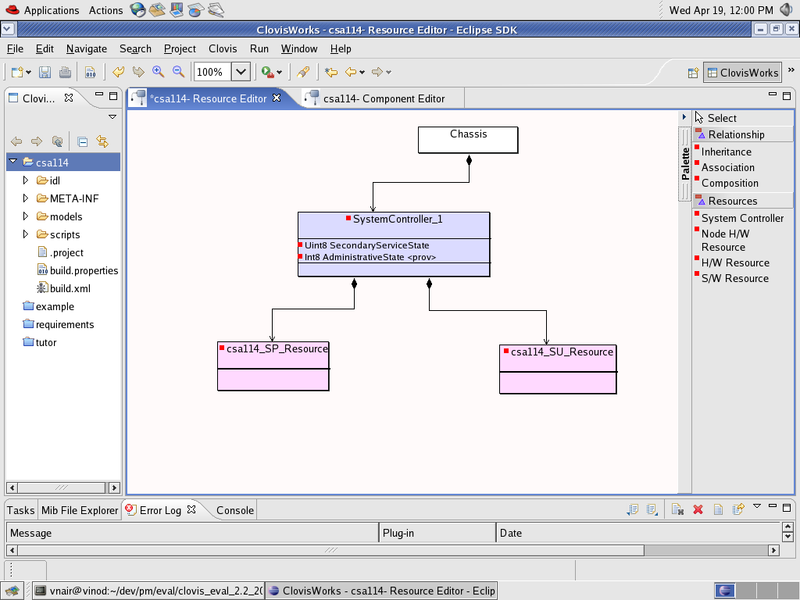 Modeling of system resources and relationships are specified using a graphical UML editor. This powerful software solution enables developers to rapidly create an information model of system resources and generate customized code for the SAFplus platform. In addition, the IDE also provides the capability to generate, compile and deploy code to the target system under development. The Eclipse-based graphical user interface streamlines the process of system modeling, information modeling and product development on SAFplus. Modeling of components and their relationships such as containment, aggregation and inheritance can be edited using a graphical UML editor. Model artifacts are reusable across multiple projects, shortening development time and increasing design team efficiency. OpenClovis IDE provides two views: the physical (resource) view, and the logical (component) view. These two views are linked, delivering a high level of visibility into the system under development. The physical (resource) view clearly displays the chassis, blades, daughtercards, network ports, other devices and the software entities running on the displayed hardware. The physical containment hierarchy is used to define the Managed Object (MO) tree and to derive the MO path (addressing) information. The logical (component) view displays service availability of the system using concepts such as cluster, nodes, service units, service groups, service instances, proxy components, non-proxy components and proxied components. Powerful, Eclipse-based graphical user interface for system modeling, information modeling and SAFplus-based product development. Model components and their relationship such as containment, aggregation and inheritance. Edit your modeled code using a graphical UML editor. Supports parallel development to enable teams to work together on a single project. The IDE provides two basic views of the system: physical and logical. The physical, or resource, view allows modeling the physical containment aspects of the system, working with chassis, blades, daughter cards, network ports, other physical devices and software entities running the cards and devices. The physical containment hierarchy is used to define the MO tree and to derive the MO path (addressing) information. The logical (or component) view is a service availability view of the system using concepts such as cluster, nodes, service units, service groups, service instances, proxy components, non-proxy components and proxied components. The resource and component views are linked with each other. The OpenClovisWorks logical view is compliant with the emerging SA Forum Information Model.